Item records are used to store information about the merchandise in your store. You should have one item record for each distinct product or service you carry. Each item record has a unique item code and may represent unique merchandise or even a group of similar items. All item records are required to have an item code, a description, a category code, and a vendor code. The category code is used to specify which product category the item record is a member of. The vendor code is used to specify which vendor you normally acquire the item from. You can also select ‘NONE’ if you don’t want to specify a vendor. To create a new Item record, click or touch the Items icon or from the Main Menu go to “Inventory” and then “Item Records” or choose Item Records from the Go Pull-Down Menu (Alt-G then I). Either Add a New Record button or F3, or Edit This Record button or (F4) to take a look at the item record details. See Record Screen Basics for more navigation instructions. Item records are divided into to the following tabs: Basic Info, Inventory Details, Codes & Measures, Pictures & Menus, Notes & Descriptions, Internet Store, Qty Breaks & More Prices, Custom Fields, and F4 = Activity. This article covers the Basic Tab. Item Description – Enter the inventory Description of the Item. This description will appear on the Cash Register screen, on printed reports, and in menu lists where this item is displayed. 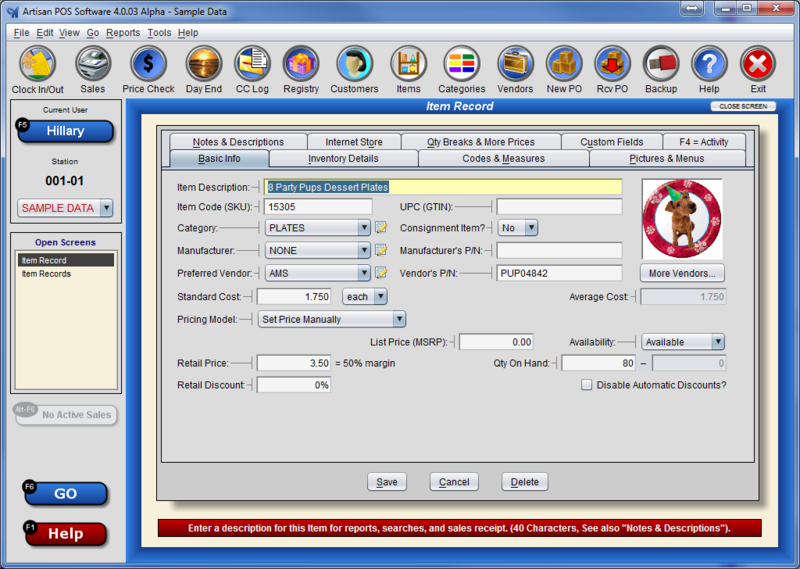 This is also the default description for merchandise item labels, sales forms & receipts, invoices and purchase orders. The text in this description can also be used in the Customer List search criteria. This is a required field; you must select or enter a non-blank Description. Item Code (SKU) – Enter a unique code that will identify this item. Item Codes may be from 1 to 20 characters long, and may contain letters, numbers, spaces, and most punctuation. The Item Code may be automatically generated by the system if you have told it to do so. In this case, the Item Code field will start out as “<<AUTO>>”. If you are using an automatically generated item code then the code will be generated when you save the record, or you can type in a specific code if you don’t want to use the automatic code. Please see the Numbering Schemes article for more information about automatic numbering. When you attempt to save a record with an existing code, a message box will open indicating that the number is already assigned and give you the option to merge this record into the existing record with the same code. UPC (GTIN) – Scan or type in products pre-printed bar code or abbreviation for this item. This could be a Universal Product Code (UPC) bar code, the Global Trade Identification Number (GTIN), or a quick abbreviation that you make up. The cash register will find items by this code and display the Item Code after a successful search. See also Codes & Measures, where you can add as many codes as you need. If you don’t want to use this field, there is an option to skip over it when you are pressing Tab or Enter. See Item Record Screen Options for details. Category – Select the Category code for this item from the pull-down menu. Select Edit List from the pull down to add a new category or click on the edit icon to edit the category you have selected. This is a required field; you must select a valid Category. Manufacturer – Select the Manufacturer or Publisher of this item. Select Edit List from the pull down to add a new manufacturer or click on the edit icon to edit the manufacturer you have selected. If you don’t want to use the manufacturer fields, there is an option to hide them. See Item Record Screen Options for details. Manufacturer’s P/N – Enter the part number that the maker of this product uses to uniquely identify this product. This is not the UPC code. Preferred Vendor – Select the main Vendor for this item. This is the vendor that you are most likely to purchase from, the More Vendors option is scheduled for release in the Artisan 4.4 version. Select Edit List from the pull down to add a new vendor or click on the edit icon to edit the vendor you have selected. This is a required field; you must select a valid Vendor or choose “NONE – No Vendor / Don’t Care”. Vendor’s P/N – Optionally enter the Vendor’s part number or product code for this item. This code is what your supplier uses to refer to this item and will appear on Purchase Orders, sometimes called style number. Consignment Item? – If this item is not owned by the store and you will have to pay for it when it is sold, then select Yes, otherwise leave it at No. The details of the consignment are revealed only if it is consignment. You can choose to use the consignment settings from the Vendor Record or enter them here by un-checking the Use Consignment Settings from Vendor Record? check box. The settings are the same as those in the Vendor Record Consignment Tab. If the item you are adding is not using the vendors default Consignment Cost Model then un-check Use Consignment Settings from Vendor? This will open the field for Consignment Cost Model and allow you to price the item as needed. Consignor Receives a Percentage “Split” of the Standard Retail Price (Before Discounts) – This option indicates that any discount given when this item is sold comes out of the Store’s Share of the consignment split. Consignor Receives a Percentage “Split of the Actual Sale Price (After Discounts) – This option shares the discount with the vendor. The percentage split will be calculated on the “Sold For” price. Consignor Receives a Percentage “Split” of the Retail Price, Minus All Discounts – This option means that the discount is not shared and only comes out of the consignors share of the split. Consignor Receives a Fixed Amount Based on the Item’s Standard Cost – This option allows you to set a specific cost for the consignor and is not influenced by your retail price. Standard Cost – Enter your cost for this item. If using a pricing model that involves a markup formula, the retail price will be based on the amount entered in this field. The real cost that gets associated for your inventory value is based on this cost upon receiving, unless you have a different cost on a purchase order, which will superseded. If you are not authorized to view costs, all cost-related fields will be hidden. You must “Log In” (by pressing F5) or selecting the selecting the Costs Hidden button on the left side of the screen, with appropriate authorization. Per Case – For items that you order in different units than you sell—that is, you order a box, or case, or roll, of (for example) 100 pieces, but sell them as individual pieces—you should set the unit of cost to “per case”. You’ll then be prompted for the case size. The cost you enter should be the cost of a whole case. The piece cost will be automatically computed and displayed at the end of the line. When you process Purchase Orders, the order quantities will be in cases, but the QOH (Qty On Hand) and Qty Requested will be in individual pieces (with the case size shown in the UNIT column). Per Square Foot – In this case, the actual cost used for this item (and any resulting Formula Price) will be based on multiplying the Standard Cost by the Width times the Height of the item (Width and Height are in the Codes & Measures tab and are in inches, so the result will be divided by 144). Per United Inch (UI) – Like “Per Square Foot”, but the calculation is based on Width plus Height, rounded up to the next even multiple of two, still in inches. This is a metric traditionally used for custom picture framing. Pair, dozen, etc. – Some units of measure have an associated quantity. These work just like “Per Case”, but the “case” size is fixed. Average Cost – This read only field displays the average cost and is calculated every time you receive merchandise or manually add merchandise to inventory, and is computed for all costing methods, even though it is only used for Cost of Goods Sold with the Average Cost method. Pricing Model – Select the method of calculating the retail price (and sometimes cost) for this item. Set Retail Price Manually – Use this pricing model if you want to put a specific price on this item, without using markup formulas. Whatever values you place in the Cost and Price fields will be used as the cost & price for this item, until you change them. However, if you do have a pricing formula in the corresponding Category or Vendor record, the Retail Price will initially be filled in with the formula markup price once you fill in the cost; change it or leave it, as you see fit. Fill in Price at Time of Sale (Department Code) – When you select this option, this item will prompt you for a price when it is entered into the Sales Screen (the cursor will move to the Price field). Also a new field will be displayed in the Item Record screen to allow you to specify the (estimated) cost percentage. Select the Pricing Model to create Department Codes, “Item Records as Department Codes,” Estimated Cost – If you want the program to compute an estimate of your cost of goods sold for fill-in-price items, enter a cost percentage (0-100) into this field. This percentage will be multiplied by the selling price to determine the cost. Pick a number that reflects your typical or average cost for items you’ll sell with this Item Code. For example, if you mark up by two and a half times, the cost percentage would be 100/2.5, or 40%. You can also enter a fixed cost into this field by deleting the ‘%” character in the field. Use Specific Pricing Scheme – If you want to have this item be priced based on a formula or other method, then you can create a pricing scheme and specify which scheme to use in the pull-down menu that is revealed when you make this selection. See Pricing Scheme Basics for more details. Use Pricing Scheme from Category – With this model, the Retail Price will be calculated from the Standard Cost, using the markup formula or price chart indicated in the corresponding Category record. Whenever the cost or markup formula changes later, the price will be automatically recalculated. Use Pricing Scheme from Preferred Vendor – With this model, the Retail Price will be calculated from the Standard Cost, using the markup formula or price chart indicated in the corresponding Vendor record. Whenever the cost or markup formula changes later, the price will be automatically recalculated. Use Pricing Scheme from Manufacturer/Publisher – With this model, the Retail Price will be calculated from the Standard Cost, using the markup formula or price chart indicated in the corresponding Manufacturer/Publisher record. Whenever the cost or markup formula changes later, the price will be automatically recalculated. Price as a Percentage Price of Total Sale – With this model, the Retail Price will be calculated based on the total sale in the Sales Screen. This is intended to be like a cleaning surcharge or insurance value or some other price that depends on with the total sale price is. If you’re using consignment, make sure that you set the split or specific cost appropriately before you sell any consignment items. Also make sure that the Consignment Discount Sharing Model in the Vendor Record is set correctly, if you ever sell consignment items at a discount. Formula Price – If this item’s pricing model is “Set Manually”, then you may see a Formula Price appear below the Standard Cost, once a cost has been filled in. This represents the price that would apply if you were using the price markup formula or price chart from the associated Category, Vendor or Mfr/Pub record, in that order (whichever one first gives a non-zero price).The Formula Price can also help you set the initial price for the item. If you have a formula in place when you change the Standard Cost, and Retail Price is still zero, the Retail Price will automatically be set to the resulting Formula Price.Once the Retail Price is set, it is not affected by the Formula Price any more. It will only change if you manually change it (or use Bulk Change Prices). By contrast, if you set Pricing Model to one of the pricing formulas explicitly, then you won’t be able to change Retail Price manually, and it will automatically change whenever the cost or the pricing formula changes. List Price (MSRP) – Optionally enter the MSRP (Manufacturer’s Suggested Retail Price), aka List Price, for this item. This field is primarily for your reference in establishing your pricing. It is generally not used by the program however, merchandise item labels can be customized to include MSRP. Depending upon your Screen Layout Options, the MSRP field may not be visible on the main Item screen; if not, it will be in the Qty Breaks & More Prices tab. 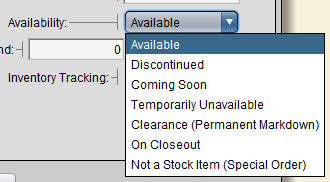 Availability – Normally set to “Available”, you can mark certain items as Discontinued, Temporarily Unavailable, or Not a Stock Item etc. Then, when someone tries to use the item in the Cash Register or on a Purchase Order, they’ll be told about its availability and asked if they still want to use it. Retail Price – The price that is displayed in the Cash Register screen when this item is entered for a sale. If this field is grey, then it is automatically calculated based on the pricing model specified (see above). This price also forms the basis of other price levels for this item, if you’re using multiple customer types; see Qty Breaks & More Prices tab article. Qty on Hand – This field shows the current quantity of this item that you have on hand, this includes any items reserved but not yet picked up, for example if an item is reserved for a layaway but has not been delivered it will show as being part of your quantity on hand. The field directly next to this shows the net on hand or quantity available after reservations have been removed. For more detail on available quantities see the Inventory Detail tab. When add inventory quantities to brand new item records Artisan assumes the inventory was received. If you adjust Quantity On Hand manually of an existing item record, you will be prompted to provide a reason for the change. This is a great way to receive items without a PO to streamline your operation. If there are any Pending Stock Corrections the quantity you are adding to the item record will be reduced by the quantity needed to remove the pending stock correction. These are created when you sell inventory that does not currently show as being on hand. Retail Discount – To put this item on sale, enter a discount, as a percentage or a specific amount, for this item. This discount will automatically be loaded into the Discount column in the Cash Register whenever this item is selected. Optionally add a date range for this item discount to be effective once you enter an amount into the discount field. Disable Automatic Discounts? – Enter a “Y” in this field to override all discounts for this item. This includes all Category and Customer discounts. Inventory Tracking – This field is also on the Inventory Details tab. For most items, you’ll want to keep track of how many units you have in stock. Inventory Tracking determines how or if to track inventory for this item. For example, Services such as “Alterations” don’t normally have anything physical associated with them, so there’s no need to attempt to count something you don’t have. But just because you are not tracking inventory counts does not mean that you are not counting sales. Sales counting does NOT depend on inventory tracking. If you track your items by Serial Number or Limited Edition, scheduled for the Artisan 4.7 release, you can set that here.